We'll admit that fruit-bowl still life was never our favorite stop on the museum tour. Yet, somehow, we're finding spring's sartorial version much more delicious. While cheeky sweatshirts and cartoon-y tops (we're looking at you, Givenchy Bambi) may have had a major moment during the past year or two, 2014 proves that playful pullovers are still trending at full speed. And, this time, they're bananas. 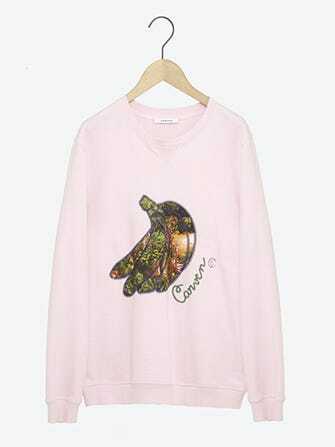 As part of the spring '14 offerings, Carven created a line of soft fleece sweaters in pastel shades with a bunch of bananas embroidered on the front. Instead of the expected yellow, though, the peelable fruit is filled in with lush, green landscapes, sparking some tropical wanderlust. Naturally, these treats — priced at about $260 a pop and available for purchase now — certainly appeal to our quirky sides. But, as far as major trends for '14 go, we can't help but ask the inevitable: Are bananas the new black?